Find hotel near Mount Artxanda Furnicular ..
Watch the spectacular soaring beauty, with the clouds circling the mountains, umbrella like ferns opening to the sky, meandering river with its sinuous curves, winding its silvery way. Watch the dense expanse patches of undulating green veldt walled in by mountains, shining vibrantly in a blue green hue. Take a ride in the Mount Artxanda Furnicular to discover the magical image of Bilbao. Mount Artxanda is one of the two mountain tops on the skirts of Bilbao. At the top, located at 300 meters, there is a park and a recreational area frequented by the locals. Apart from that, the panoramic views of the city are astonishing from almost any spot. The furnicular which is now a typical image of Bilbao was built almost hundred year old rack railway links the valley cradled Bilbao with the recreational centre at the summit of the nearby Mount Artxanda, which has a park, several restaurants, a hotel, and a sports complex. Opened in 1915, but faced a lot of difficulties such as the Spanish Civil War, an accident that injured several employees in 1938, followed by floods but finally by November of 1938 it was fully functional and running. The furnicular takes 3 minutes climbs over 200 metres during a 3 minute ascent, eventually dropping ridersoffat the summit. It runs on a single track with the help of electricity and there are 70 people per car. Its departure is just north of Zubizuri Bridge on the right bank of the shimmering river Nervion, and is within walking distance from the Guggenheim Museum. Services run every 15 minutes throughout the day. The bright read wagons moves slowly so that you witness the beauty below you and the smooth ride allows you to take stunning pictures as well. Since it is open till 10 pm, a ride at night would be spectacular as well as the lights in the city of Bilboa will be glittering like gems. You’ll also discover more than just views. There is a park for children, fitted with benches and a sculpture of a thumb print which looks awesome if looked at from a distance. The recreational centre you can sample regional cuisine such as pinchos, essentially Basque tapas with an almost-gourmet twist, or sip on txakoli, a local dry white wine. The ride is a bit slow. The descending station lacks light. There are two carriages and it takes time to start. They are in need of renovation to remove the graffiti and paint. Tickets can be bought at the stations or the Creditrans card can be used. At times during the off season, prices are reduced to €0.29. Recommended time to visit is Late morning or evening. Public holidays it opens at 8:15 am and closes at 10 pm. In the months of June, July, August and September it closes at 11 pm. Bilbobus: Route 72 stop in front of the Lower Station. Bilbobus: Route 26 will take you to the Lower Station. Bilbobus: Route 11, 22, and 71 all take you to the Lower Station. Bizkaibus: Route A3216 will take you to Artxanda sports centre. Bizkaibus: Route A3223 will take you to the Lower Station. Love this? Explore the entire list of places to visit in Bilbao before you plan your trip. Fancy a good night's sleep after a tiring day? Check out where to stay in Bilbao and book an accommodation of your choice. 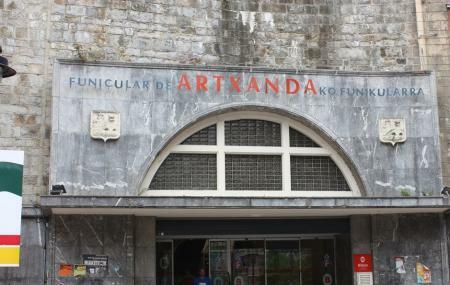 How popular is Mount Artxanda Furnicular Bilbao? People normally club together Guggenheim Museum and Iglesia De San Nicolás while planning their visit to Mount Artxanda Furnicular Bilbao. Great way to get to view point. We got bus back down for a different perspective but the funicular is very quick and you can use your travel card. It's a nice and different way up plus you get great views of the surrounding area. Sadly on top there is not much to do. I went when it was cloudy and the views was not as clear due to cloud. Great views over Bilbao from the top, but not an awful lot there, just a small park area. The funicular itself rises up a near vertical hillside. A good way to pass half an hour if you're in the area. 3:75 Euros for return journey. Stunning views over the Bilbao.